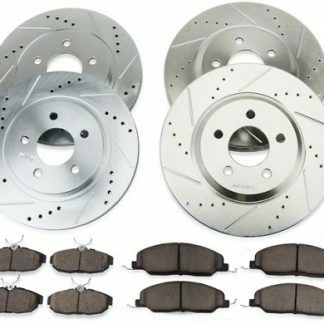 Choose Options: Front and or Rear, Bright Silver Standard or Black Zinc Rotors and With or Without Heavy Duty Brake Pads. Tired of warped rotors or do you just want increased braking power? Well, here is your solution and you will notice an immediate difference. Easy to install and guaranteed to fit with an unheard of 3 yr manufacturer’s warranty against warping and or cracking you can trust what you are buying is a quality product. While we sell other brands of brake rotors, we here at Rotor Depot only use 360 Performance Rotors on our personal vehicles. Tried and tested by us, you won’t be disappointed! All 360 Performance Cross Drilled and Slotted Brake Rotors are precision-machined and finished in our U.S. facility. Every rotor is inspected using the strictest quality control standards and checked for compliance with factory dimensional specifications. 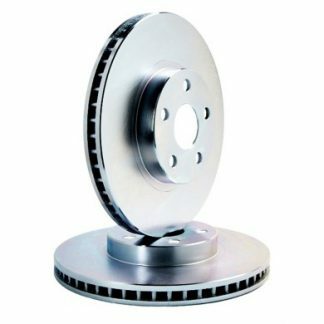 Our rotors are manufactured from premium-quality cast iron that meets or exceeds G3000/ISO9002,QS9000/VDA 6.1 specifications. Each rotor is double-disc ground and machine-mill balanced for optimal high-performance operation. We are so confident about the quality of our products that we offer the best warranty anywhere! Each Performance Full Curve Slot is strategically machined off the edge of the rotor to dramatically improve braking performance by up to 30% over factory stock brake rotors. Our slot design removes water, dust, and debris whilst minimizing the heating of the pad surface. Slots that are machined in the center of the pad surface are inefficient and only collect dust. The edges of our slots are machine-rounded to achieve maximum degassing and dust removal. Each Cross-Drilled hole is perfectly sized to allow for maximum ventilation without structurally weakening the brake rotors. Cross-Drilled Holes move air from the pad surface whilst reducing surface temperature, eliminating hot spots and warping. Each drilled hole is chamfered to eliminate stress cracks, as well as to provide long-lasting performance. Our Performance Rotors have a corrosion-protection finish in Black or Silver that is electrostatically applied. The Zinc Coating Process is an extensive hand-applied operation that is not sprayed on like inferior coatings. Each Performance Brake Rotor is immersed in different solution tanks throughout the coating process. The final result is a thick protective coating that will help prevent rusting and give you a great custom look. 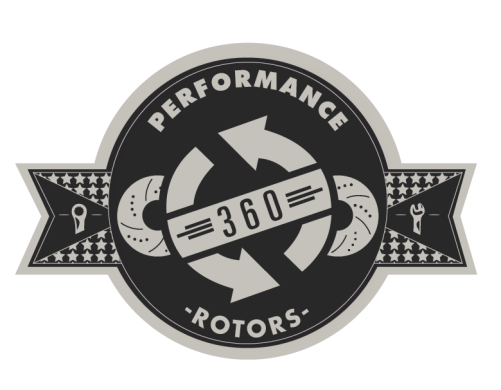 360 Performance Rotors are machined to the same fit and dimensions as your factory brake rotors. You can install them with no worries about factory fit or function. We recommend that you have a certified mechanic install them for proper break-in procedure. 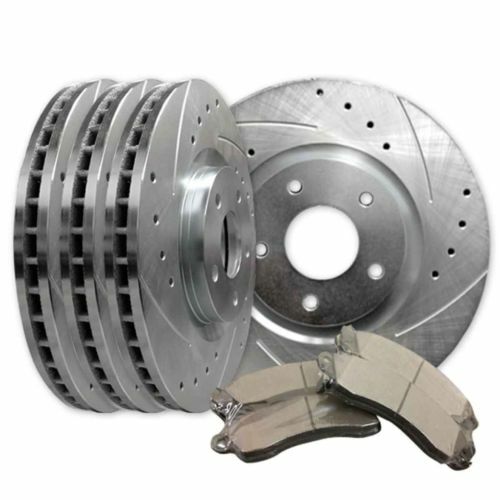 If you have any questions or need assistance choosing the correct brake rotor for your vehicle, contact our brake experts at sales@rotordepot.com. 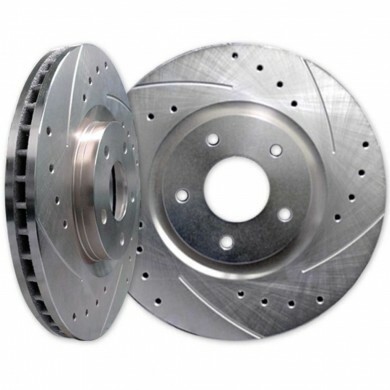 Cross Drilled and Slotted Brake Rotors are ideal for all domestic and foreign light, medium and heavy-duty Cars, Trucks, and SUVs, as well as any vehicles that require improved braking performance. Rotor Depot – Premium Semi Metallic Brake Pads are manufactured using the same positive molding process utilized by Original Equipment suppliers. Positive molding uses extreme pressure to compress the friction material and bond it to the backing plate. This process assures consistent friction material density throughout the pad, resulting in even wear and performance characteristics throughout the life of the brake pad. 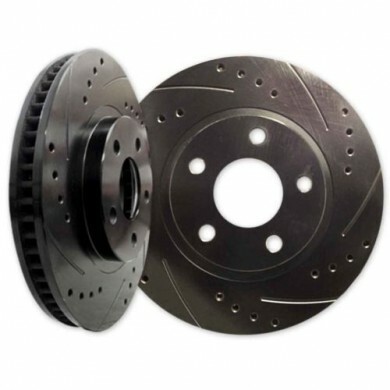 The brake friction features either precision cut or shaved backing plates and mechanically attached shims; these small details ensure proper fitment in the caliper and virtually eliminate noise associated with pad vibration. In addition to these features a scorching process has been added to all of the Premium Semi Metallic brake pads. This additional process forces any impurities out of the friction material and pre-burnishes the pads to greatly accelerate the break-in process. These Premium Semi-Metallic Brake Pads have the highest temperature fade resistance and friction level of any Brake Pads we sell. Designed to give you the best stopping power in all weather conditions and guaranteed to give you noise free braking with low Brake Pad dust. 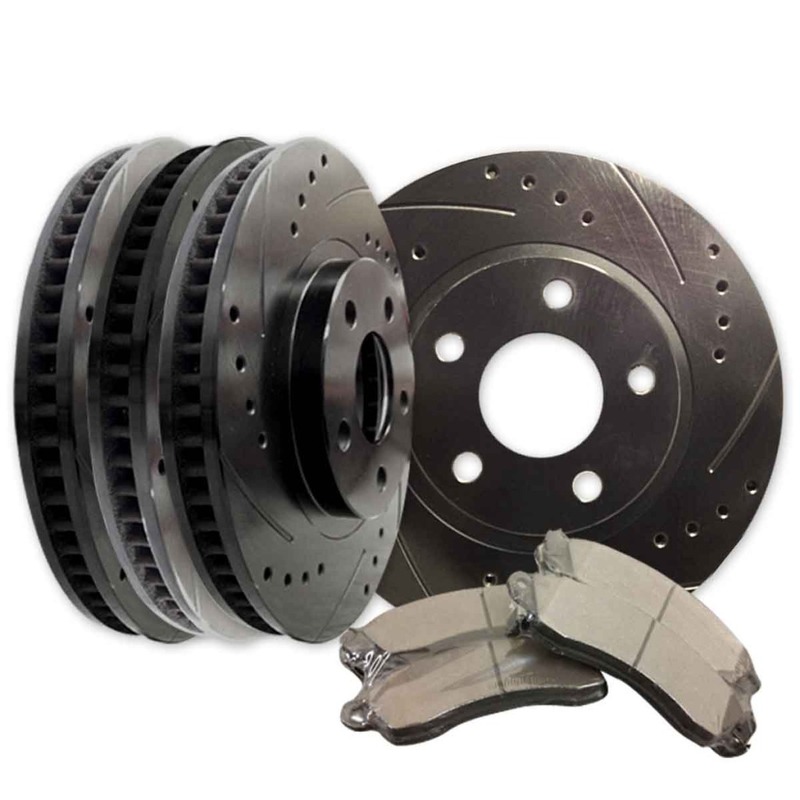 Manufactured with a high heat range and high friction level to handle extreme heat generated by vehicles prone to warping brake rotors. 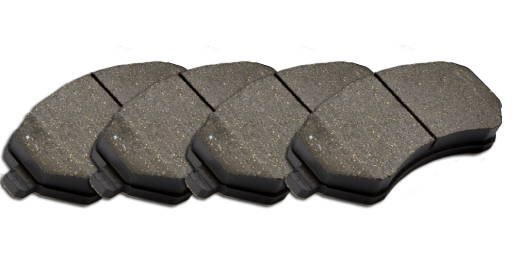 Each set of Brake Pads include Metal shims to eliminate vibration and give you noise free braking. Tough enough for heavy duty applications but gentle on your rotors to prolong the life of your brakes. Designed and manufactured with a positive molding process for stable friction performance and even wear. Precision cut or shaved back backing plates to exact original equipment manufacturer dimensions and specifications. Special manufacturing process is added to force impurities out of the friction material to accelerate the break-in process. Brake Performance Premium Semi Metallic Brake Pads are backed by a Lifetime Warranty against defects in materials and workmanship. Each pad is exhaustive dynamometer and fleet vehicle tested to meet and exceed all safety standards. Rotor Depot Premium Semi Metallic Brake Pads are guaranteed to be the same fit and specifications as your and factory brake pads. You can install them with no worries about factory fit or function. We do recommend you have a certified mechanic install them for proper break-in procedure. Below is our installation procedure to help you break-in your Pads. If you have any questions or need assistance choosing the correct brake rotors for your vehicle contact our brake experts at sales@rotordepot.com. Rotor Depot Premium Semi-Metallic Brake Pads have a highest temperature fade resistance and friction level and is designed to give you the best stopping power in all weather conditions and guaranteed to give you noise free braking with low Brake Pad dust. Premium Semi Metallic Brake Pads are ideal for all domestic and foreign light, medium and heavy duty Cars, Trucks, and SUV’s and any vehicles that require improved braking performance. Highly recommended for heavy work trucks and all types of towing applications. See our comparison chart to help illustrate your vehicle recommendations. Photo Disclaimer – The Product Photo is for display purposes only. Actual product may vary in size and bolt pattern. Very heavy compared to stock, great quality and well packaged. My truck stops much faster than it ever did with stock rotors. Awesome!! So happy I bought these and I can’t believe the difference. I purchased drilled and slotted black with brake pads. Thanks! After warping factory rotors, sold by the dealer, twice!!! I went with 360 Performance Rotors in hopes it would solve the problem. I have 15,000 miles on my truck now without any issues, braking is still firm like when they were installed and I have no annoying squealing like before. Very happy. Great product, major improvement over stock!